Lunch (pizza) will be provided for the competitors, and is included in the registration fee. If you prefer something besides pizza, there are many other options near the school. 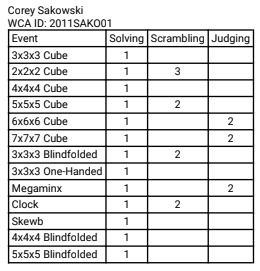 We may hold a second round of Skewb (Top 16), and then a second round of 2x2 (Top 16) if time allows before 3x3 Final. Your registration is not considered complete until your payment is made. Registration is free for RHHS students, faculty, staff, and alumni. You are viewing the schedule for the venue River Hill High School. There are couple small things you all need to be aware of, so please watch this video for this information. It's important, so please don't ignore it!